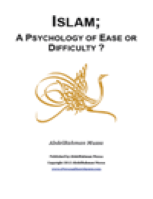 ISLAM: A PSYCHOLOGY OF EASE OR DIFFICULTY ? This small book aims to explore the following questions: Does Islam promote ease or dif;iculty? There are those in Islam who claim that the path to Allah is dif;iculty. Is this true? In Islam we derive our understandings from two primary sources: The Quran and The Sunnah of The Prophet, peace be upon him. There are secondary sources of course but this book will only focus on the primary – only because that’s all that’s needed.